Cavallo Point, the Lodge at the Golden Gate is the perfect starting point for nearby walks and day trips. Guest contributor Laura Kelly shares some of her rich experiences. When we checked into Cavallo Point, the Lodge at Golden Gate, the front-desk clerk had pulled out a large fold-out park map and highlighted several of the many paths and hikes available around the property (including a way to walk up to and across the bridge). The “intro walk” was a 3-minute one down to Horseshoe Cove at the foot of the Lodge, home to a small yacht club/marina and the Bay Area Discovery Museum for kids. The cove is part of a larger Fort Baker Walking Cell Phone Tour, for those interested in area history. Horseshoe Cove marina (and the bridge, of course). 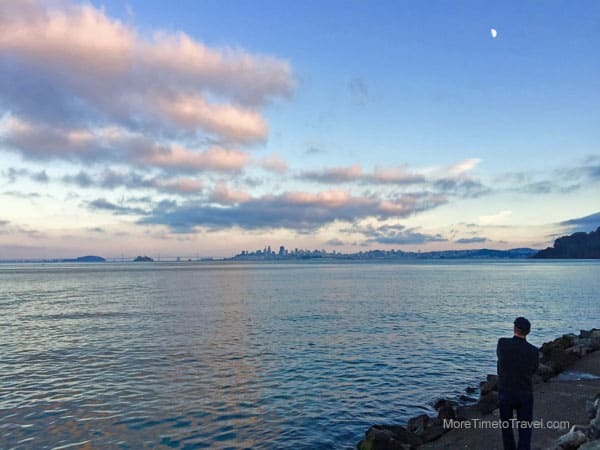 Walk up a short but steep path above the cove and you’re presented with breathtaking views of rolling parkland hills and the far-off skyline of San Francisco (and Alcatraz Island). At this point, you’re standing on history: directly over the Yates cannon battery that was built into the hill more than 100 years ago to defend the harbor. A hilltop panorama, showing where the fog ends. That’s San Francisco’s skyline in the middle. Later that day we walked into Sausalito, a 40-minute medium-level walk (up and down hills) on the paved Fort Baker Bay Trail along the East Road into town. It was an enjoyable ramble, passing by numerous lookouts and picnic tables, ending up on the long Sausalito shoreline walk (Bridgeway Rd.) into town. The view walking down the hill into Sausalito. Inspired by an article I’d read on the internet (We Took the Stairs) about climbing 120 stairs up a hidden pedestrian passageway to do a tour of the hillside neighborhoods in Sausalito, I had planned to add that on to our walk. My husband was hungry, however, and nixed that idea. We decided we were in the mood for good wood-fired pizza, so walked another half mile or so along the water to Bar Bocce next to the Sausalito yachts. It was worth the walk: the delicious speck and burrata pizza with lollipop kale sprouts and fried capers was nearly topped by the creative salad we shared (Little Gems lettuce with radicchio, avocado, marcona almonds, and fennel pollen). Nice Sausalito marina view from inside Bar Bocce. Delicious Little Gems salad (that’s “fennel pollen” and Marcona almonds scattered around the dish). We debated whether to take a taxi home (there’s always a line of taxis waiting patiently near the Sausalito ferry dock) or walk home in the waning evening light. We decided to go for the walk, and got some beautiful sunset photos on the way back, while scaring a timid deer back into the woods at one point. Beautiful pink and blue sunset on the walk back from Sausalito. Horseshoe Cove with San Francisco lights in the background. You know you’re back at Cavallo Point when you see the bridge. Not every national park lodge has the advantage of being only a 20-minute drive or ferry ride away from a world-class city. So, on our third day we took a quick ferry ride over to San Francisco from Sausalito, and had a grand time going to a Stanley Kubrick exhibit at the Contemporary Jewish Museum. Note to the wise: the retro-cool Wise Sons deli located in the museum lobby has a killer pastrami sandwich, but they close at 2 pm. A very creative exhibit with annotated scripts, props, costumes, and film clips. Kubrick was heavily involved with his films’ iconic poster designs. We did a lot of other touristy city stuff that day but it was all a bit of a culture shock after the peace and serenity of Cavallo Point, and we looked forward to getting back to our retreat. We ended up taking the 20-minute ferry from San Francisco back to Sausalito as yet another spectacular sunset took place—you can’t take a bad shot in that scenic region! The next morning before we checked out we took one last hike on the property, on the Chapel Steps trail, climbing up a ton of steps to enjoy the aerial view of the resort. A foggy view after climbing all those stairs. It had been a cool and misty morning, but the fog burned off as we walked and soon it was another sunny, warm day with the familiar Cavallo scents of sage and lavender filling the air. A golden morning walk on Cavallo Point’s trails. Read about Laura Kelly’s luxury hotel stay at Cavallo Point, the Lodge at the Golden Gate. Wow! looks wonderful place. I thoroughly enjoyed the post. I liked that yummy Little Gems salad & its really awesome sunset view. Thanks for sharing your Cavallo experience. Thanks, Vidya! We came across “Little Gems” salads at a few different California restaurants and I learned along the way that “Little Gems” refers to greens that look like tiny versions of Romaine lettuce, with a crisp, crunchy texture and a sweet flavor. The salads were always creative and super-fresh. Ah, California…. A mesmerizing view from the Golden Gate, seeing that makes me adore it more .